A new trailer for "Shaun the Sheep the Movie," the new animated feature film from Britain's Aardman Animation. You may watch it above. "Shaun the Sheep" is written and directed by new directors Mark Burton (writer of Madagascar, Gnomeo & Juliet) and Richard Starzack. The voice cast has not been announced. 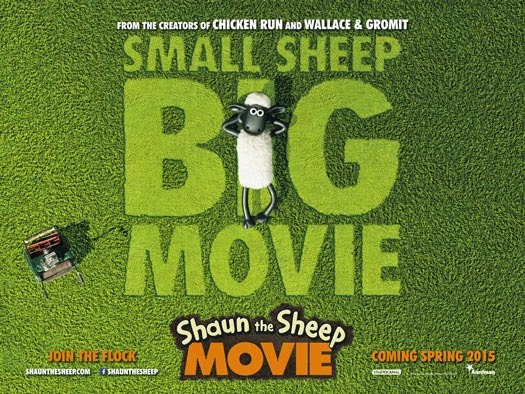 As shown in the trailer, Shaun and a bunch of his sheep friends end up stuck in the big city, leaving them with no choice but to find their own way home. StudioCanal sends the film to theaters in the United Kingdom on February 6th, 2015. Whether or not the film gets a release in the United States is not known, they are probably still negotiating for a distributor. Aardman is not nearly as popular in the States as it is in the UK. That's just a fact, not a slam. It is distinctly British humor, which you may not realize if you are, well, British. If you asked 1000 people in the States who Aardman or Shaun the Sheep were, you'd probably get 1000 different answers, none of them correct. The film may only get a limited release in major cities in the US for awards consideration. We posted the original trailer back in April when Ardman gave us a first peek. Here it is for convenience. From ardman, the creators of Wallace & Gromit and Chicken Run, SHAUN THE SHEEP THE MOVIE is coming to cinemas worldwide from Spring 2015! Watch the new teaser trailer to see Shaun and The Flock on their hilarious adventure in the Big City!